Pro: The Untethered Soul is an absolute wake up call. The way Michael Singer presents the relationship we have with the voice in our head is down-to-earth, relatable and simply ah-ha moment after ah-ha moment. 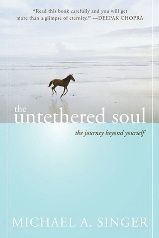 Con: The book explores many topics along the spiritual path with the same formula for getting there. This can lead to some confusion early on in chapters toward the last-half of the book regarding the “how-to” until you realize it is another facet of the technique you’ve been learning all along. I never highlight books. It is very rare for me to make notes or mark something for reviewing later, especially since I read most of my books on a nook now. Yet, with The Untethered Soul, I highlighted just about every third sentence. It is that good. Michael Singer presents the spiritual journey in a way we can all relate to because we hear it yapping all day long…the voice in our own mind. He asserts that if you listen intently to this voice, you will discover that it is the root of all of your problems. It argues both sides of every issue, it forces you to act and look a certain way, it creates boundary after boundary in an attempt to control your surroundings. Singer presents that the spiritual journey is about separating from this voice. The “Seat of the Soul” or pure consciousness is always present within us as a witness to our lives. That force is our true identity. Yet, we convince ourselves that the yippy voice we hear the moment we wake up is who we are. The book is about learning to create space between yourself and the cause of all of your issues by becoming a witness to your life instead of focusing on controlling every aspect of it. While this may sound esoteric, it is presented in such a practical way that it clarified concepts I had read about for years in a way that is directly applicable to everyday situations, without sitting on a meditation cushion for years. I only found myself confused on a few occasions as the book delved deeper along the spiritual path to explore things like “unconditional happiness” and “nonresistance.” I wondered if Singer was jumping to a new technique or philosophy, but as each chapter moved along, I realized that these are just new aspects of the journey that will appear from practicing techniques presented earlier. If you are ready to get really serious about changing your relationship with your life to attain the ultimate freedom, freedom from yourself, this is the book to start with!